There are no words to properly thank you for being the Best Man at our wedding. From planning a first-rate bachelor party with all the groomsmen to helping us organize a last-minute change of venue for the rehearsal dinner, you were amazing! And we were so touched by your wedding toast and your thoughtful wedding gift of engraved champagne flutes. You had an important role in making our wedding day spectacular. Thank you for being such a wonderful friend and Best Man! Your kindness will not be forgotten. I want you to know that it meant the world to me that you were standing by my side as best man at my wedding. As my dearest childhood friend you’ve been with me through ups and downs, and have always encouraged me to keep traveling the high road and keep moving forward to achieve my goals. Thank you for always being there for me. Because of your positive influence I’m the man I am today. And thanks for not embarrassing me during your Best Man speech at the reception. We have so many ridiculous anecdotes and I had no idea if you were going to pull one out of your sleeve and share it with everyone! LOL. But seriously, I appreciate everything, including your very thoughtful wedding gift. I felt lucky to have you as my best man for a day and even luckier to have you as my best friend for life. Thank you for being an important part of our wedding day. And I must say, you really clean up well and know how to rock a tux! The toast you made at the reception was pretty darn awesome. Man you could really moonlight as a comedian. And the bachelor party last week in Vegas was over-the-top incredible. 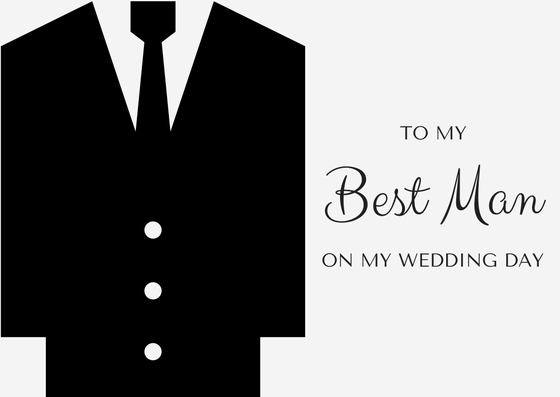 You did a great job with your best man duties – 100%!